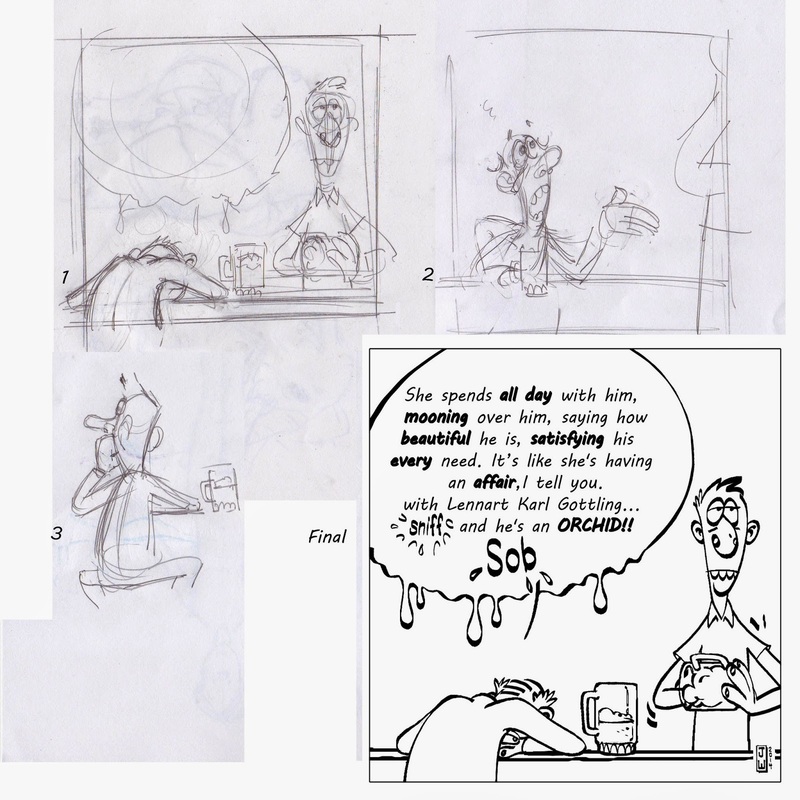 It's interesting to consider what comes first when doing a cartoon; the drawing or the writing. In this case, the joke as a whole came first to mind - a guy in a bar complaining to the bartender that his wife was having an affair with one of her plants. But after that, what's next? I'm by no means an expert in drawing or writing comics and I bet there are a variety of ways to proceed, but in this case, I did the writing before drawing. "What else do you call it? She spends all day with him, mooning over him, saying how beautiful he is, satisfying his every need. She's having a love afair...with Lennart Karl Gottling *sniff*... and he's an ORCHID! *SOB*"
You score two points if you noticed the spelling mistake. I'm a terrible speller which, incidentally, is one of the reasons I don't do hand lettering! Apart from fixing the spelling mistakes, I refined it a bit and decided what words to emphasize with bolding. When I started the drawing, the first (drawing #1) came out like the final composition, but before I drew anything, I contemplated composing the piece more like what's shown in drawing #2. In my mind I saw the poor guy from the bartender's point of view, perhaps waving the beer stein around as he blubbers, but when I drew it, I didn't find it very interesting. The bar itself could have been indicated by the word "Bar" written backwards behind the complainer as if it was painted on the bar's front window - I've seen that done to good effect - but I didn't feel like doing that. I wondered about having the schlub reflected in a mirror behind the bar and the bartender, but that gets complicated and time consuming and part of the point of these comics is just to get the things done, as imperfect as they may be, just to get them out. Drawing #3 shows how I was thinking of showing the schlub's emotional state more, fist to mouth in a cold sweat but drawing didn't work for me. He looks like he's burping or something, not worried. I could have refined it to make it work, but I didn't think this was a profitable direction and it was taking too much time, so I went back to the compostion shown in drawing #1. I find the bartender's facial expression is one of the best parts of the comic and helps us to understand how to feel about the customer's complaint. Even better, since we don't see the schlub's face, just "hear" his complaint and see his body slumped posture, we imagine his expression, which saves me the hard work of having to draw it! So what comes after imaging the joke? Perhaps just doing whatever part or piece you can see or figure out, then the next, then the next and then it's done.